Built: Late Middle Ages and 17th century. Notes: Dunluce Castle (from Irish: Dun Libhse) is a now-ruined medieval castle in Northern Ireland. It is located on the edge of a basalt outcropping in County Antrim (between Portballintrae and Portrush), and is accessible via a bridge connecting it to the mainland. The castle is surrounded by extremely steep drops on either side, which may have been an important factor to the early Christians and Vikings who were drawn to this place where an early Irish fort once stood. Dunluce Castle is in the care of the Northern Ireland Environment Agency. It is a Monument in State Care sited in the townland of Dunluce, in Coleraine Borough Council area, at grid ref: C9048 4137. The earthworks, adjacent to Dunluce Castle, are a Scheduled Historic Monument, at grid ref: area of C905 412. 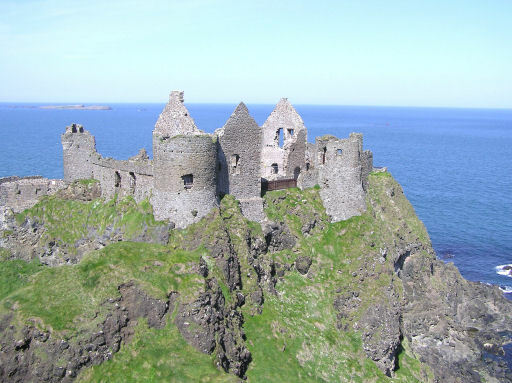 Guide to Dunluce Castle in Ulster-Scots DOE.